The Warialda Strategy Plan aims to provide vision and direction for Warialda for both the long and short term. By focusing on its public spaces: the parks, streets and riverside areas,Warialda can provide the setting and amenity to support future growth. Progressive improvements to the streetscape, in tandem with good planning decisions, can create a renaissance to rival the town’s architectural golden era during the 1890’s. This placemaking renewal will reinvigorate Warialda as a place for the future, not just of the past. meeting and a series of seperate meetings with special interest groups and an open-shop period of five days when one-to-one discussion and input occurred. People’s ideas filled the walls of the shop to become an emerging display of potential directions. 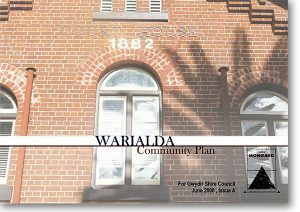 The Warialda Strategy Plan aims to implement the community’s vision through a series of short term physical improvements to the town’s public spaces, through further development and strengthening of key town paths and linkages, and with long term planning solutions. The Strategy Plan reflects the communities vision for the vibrant, energetic place thatWarialda will be in the future. Bingara has assets which many towns would dream of having. It has an historic main street with active shopfronts and a walkable shopping area. There is plentiful on-street and off-street parking, and plenty of room for cars and walkers. Broad avenues with pleasant homes still contain clusters of shade trees, and in these places, Bingara is a very attractive town. The river provides a dramatic elevated entry point into the town heart, and its treed banks create a scenic town setting. Bingara’s lookout provides panoramic views to the surrounding rural landscape. No wonder people who pass by decide to stay a while. The patterns of growth, funding and demographics are making it ever more difficult for country towns to stay viable. Towns need to be pro-active to attract workers, businesses and new residents. 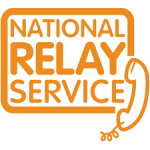 Strategies have to be built which are grounded in local support and can be actioned by local people. The strategy plan is based on ideas that residents and visitors developed during workshops and shopfront consultations. The consultants have built on these ideas and shown how they can be implemented in different parts of the town. There are many things that can be done to make Bingara more robust to change. The important thing is to act. 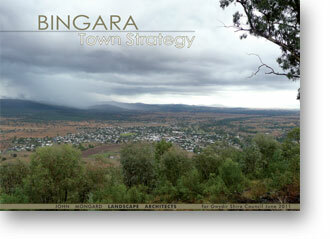 This strategy provides actions to make Bingara a more lively and prosperous town in these uncertain times.